AKRacing Onyx Series ▷ Review, Size & Buying Guide! Real leather gaming chairs are exquisite. That’s why AKRacing decided to launch their first genuine leather series – it’s called Onyx. However, the standard Onyx is covered with PU-leather. If you want to order the real leather model you have to choose the Deluxe version. This is exactly what I did recently and we are going to examine this chair to the bone in today’s review – stay tuned for some surprising intel! 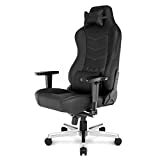 The first brand that offered a genuine leather chair was noblechairs – the EPIC Series had a great start in the German market, and it seemed like people have been missing a high-class chair that provides a bit more than the standard gaming chair with PU-leather and wobbly armrests. Let’s see if the Onyx series is on a par with the very successful EPIC and ICON Series. AKRacing Goes Real Leather – What To Expect? As you will read a few scrolls further down, the Onyx series is made for a wide range of user heights & weights, also accommodating bigger and higher gamers compared to AKRacings standard models. The other specs are kind of typical – we have 3D-armrests, a steel frame and an aluminium base. The parts including the class-4-gaslift carry gamers up to a weight of 150kg. Of course, you will find neck- and back pillows in your package, the backrest can get reclined up to an angle of 180° to the seat and the chair provides a lockable rocking from 3-18°. When I recently tried out the Onyx while preparing for my review of this interesting chair, I noticed that the lumbar area is ergonomically shaped. While this is still uncommon within this niche, it is a welcome bonus since it makes the chair usable without the lower pillow. Overall, the specs will sound familiar to you – they are nothing special, just the typical gamer chair that we know except for the genuine leather covering and the design. To give you a quick hint upfront: The Onyx Deluxe is neither perfect nor a pratfall. It is an above average gaming chair that will most definitely please a lot of you guys – not only with its great looks but with qualities that are unquestionably there. Want to know more? Watch my video – even though it is in German (voiceover/subtitles coming soon) – and much more important: read through the whole review before buying or giving up the Onyx. Alright guys, I will skip the assembly-part and jump right into the review. Let us start with my first impressions and continue with the test-sitting afterwards. Simply elegant – that is how I would describe the optics of the Onyx in two words. At first glance, the silhouette appeals rather classic but once analyzing the chair closer you notice the missing belt holes and the flattened out side boulders. Furthermore, the dark grey, almost black coloured Onyx trumps with its elegant diamond stitchings throughout the lumbar region that reminds me of noblechairs – in a positive way. The dimensions offer above-average space – on paper, however, consistently a bit less than the ProX‘s measurements (after all the flat side boulders of the Onyx compensate for that). The sitting height can be adjusted from 46 to 51 centimetres while the backrest comes with an effective height of 84cm. In my size guide down below you will find out if the Onyx offers enough or too much space for your stature. Thickly padded side boulders and the beautiful diamond pattern. The seat does not just look comfy – it is really a pleasure to sit on it. The side support is decent and comfortably cushioned while offering lots of breathing room. Also within the shoulder region, the side support is rather reserved leading to an elegant but still sporty silhouette. As stated above, the side support, as well as the shoulder “wings”, have received some extra padding and a rather flat design. The fact that the boulders do not constrain one’s thighs allows heavier and broader shouldered gamers to sit in a comfortable, ergonomic position. The neck pillow is a little stiff – I would also say a little tiny-ish – but does its supporting job. Within the lumbar area, one can find a gentle bulge which makes it possible to go without the mandatory cushion. If you absolutely want to use the lumbar pillow, the missing attachment ropes might become a little annoying. Compared to the common 4D-armrests of other models the Onyx lacks the “inside-outside” direction. To be honest, I do not care at all about that and fortunately, during my review, I also noticed that the missing direction make the armrests less wobbly. The plastic surface succumbs a bit when you press on it which protects one’s elbows from too much strain – the Onyx does not do this any better or worse than it’s competitors. The aluminium base is reinforced by several struts lenghtsways and accross the bottom of each foot. Optically the base is kept in a rather plain design but offers a nice contrast to the onyx coloered covering with its stainless steel look. On a closer look, one can spot little processing flaws. Although this is common with almost all midpriced gaming chairs – except for premium models like the EPIC or ICON Series – I did not expect to see any of those in my Onyx review. Overall this issue is a rather minimal downside. Haptic: How does the Onyx Deluxe feel? Since the Onyx Deluxe is covered in genuine leather I had high expectations upfront. After reviewing the chair I would say that it definitely feels very robust and cosy with its typical natural structure but it is a bit harder than I expected to set it apart from high-quality pu-leather. In this regard noblechairs definitely does the better job. Overall, you still get a noticeable quality boost for the deluxe surcharge compared to cheaper or commonly prized gaming seats. The Onyx Series provides a little more space and more flat side boulders than lower tier chairs like the Nitro or Prime. The weight limit, however, is limited to 150kg. I am not sure if gamers with a bodyweight of about 150kg will sit comfy on the Onyx – I think that the thighs might become a problem for people reaching the weight limit. There will not be enough space on the seat. But that is a widespread problem, and I do not think that any gaming chair fits a person at 150kgs body weight entirely – maybe the Tank Series does. The accommodated range of user weights and heights is very similar to the EPIC Series. In comparison the minimum sitting height is about 3cm lower here so that people who are a little smaller than 1.70m could theoretically buy the Onyx – the only problem is the shape of the headrest that does not allow lower positions. People tinier than 170cm will not be able to adjust the neck pillow as low as they need it. That is why I would say that gamers need to have a minimum height of 1.70m to profit from all the ergonomic potentials of this chair. The measurements of the Onyx Series allow a maximum user height of about 2 meters. The Onyx features generous measurements and even fits beefier, broad shouldered gamers thanks to the unobstrusive siude boulders – it is very comfortable and offers a lot of freedom. The sitting experience is awesome: Lots of breathing room and still sufficient racecar feeling through the Onyx’ pleasant side support. The real leather of the Onyx Deluxe offers a palpable upgrade in matters of comfort compared to common PU coverings. A better sitting climate is to be expected and the haptic is great. Regarding adjustability, you might miss the non-existent inside-outside direction of the armrests and maybe the integrated lumbar support might turn out to be insufficient for your stature – personally, this does not bug me. In exchange, you get firmly attached armrests and you can probably go without the (sometimes annoying) lumbar cushion. Apart from all that, the Onyx leaves nothing to be desired. The Onyx Deluxe is a better-than-average equipped and manufactured gaming chair. Yes, it has few wrinkles more then its competitors from noblechairs while the quality of the leather also falters in a direct comparison but the Onyx is still worth buying. If you like the design, my size guide gives you a thumbs up and if you are willing to overlook the suboptimal pice-performace-ratio got for it! Amazon ist one of the best sources to buy your Onyx or Onyx Deluxe from. What I like about Amazon is Prime – order today, get it tomorrow. If you want to test ist, get your 30-days-trial ▷ here.